These days when you hear "remake" you'll typically conjure up images of an old game being recreated from scratch using modern-day standards—developers creating a new experience where the plot and overall progression stay the same, but the details along the way are significantly re-tooled and re-imagined. Maybe an RPG gains advanced combat and growth systems from a more recent release in the series, or a first-person shooter gets "enhanced" with regenerating health and scripted events. The Legend of Zelda: Ocarina of Time 3D is not your typical remake. When it first released on the Nintendo 64 in 1998, the original Ocarina of Time set a mechanical standard that, arguably, has yet to be eclipsed. It's a game that doesn't necessarily need improving, at least in terms of its core gameplay. Its visuals are obviously a product of their era, but the main experience has aged amazingly well. Ocarina of Time 3D takes these facts into account. Pulling heavily from the "if it ain't broke don't fix it" school of design, Nintendo and co-developer Grezzo haven't remade a classic—they've created the definitive version of the classic itself. This isn't a new game that channels Ocarina of Time, this IS Ocarina of Time. Ocarina of Time 3D is extremely close to the source material in execution. They've reproduced those original sensations exactly—the same physics, the same construction and placement of everything in the world, the same music—but everything's actually been redone. The music might sound unchanged, but in truth it was made from scratch and great effort was spent in reproducing the original compositions. The characters and world have been redesigned, but only so far as the original game and its associated art assets intended. This is Ocarina of Time—the purest possible representation of Ocarina of Time you could reasonably make without losing something meaningful from the original. This is the game they would have made in 1998 if they had a 3DS to make it on. It's impressive that Grezzo managed to strike such a successful balance between maintaining the feel of the original Ocarina of Time and upgrading its visuals to match our hungry expectations. 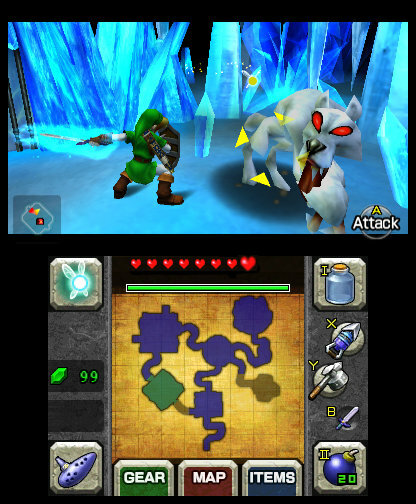 The majority of the structural boundary lines from the original game have been left intact, but significant new polygonal detail has been added therein. Character models are the most obviously improved, but many structures have been made more organic, and a huge amount of detail has been added to existing flourishes like wall sconces, door treatments, and statues. Most impressive are the redone shops and building interiors, which have been upgraded from laughably sparse pre-rendered backdrops to densely adorned abodes positively dripping with character and texture. It's a persistent theme in the new visual style, that of texture. And not just "textures" in the technical sense, though those have been hugely upgraded throughout the experience, and are the primary contributing factor (along with the new lighting engine, particularly stunning during dusk and dawn) to why things look so good. I mean artistically and thematically. The shop and residence interiors are a great example, where it's not just about making the room "look good," but rather filling it with a million little trinkets and fliers and posters that help sell it as a real place. Most of these are all new art, and they go a long way towards making Hyrule look like it's actually being lived in. These myriad details, peppered liberally throughout the foreground and background, really enhance the sense of 3D you get with the slider up. Oh this game is in 3D, did you know? It's easy to forget about that leading up to a game's release, so flat are our internet medias. I've been waiting for a title like this though, a land I can run around and adventure in freely, to truly appreciate the 3D's ability to create a world behind the screen. Foliage is particularly impressive with the effect, with the trees in the canopy of the Lost Woods and around the edges of the fishing hole making things feel that much more... real. Entering Kokiri Village just as the sun comes up and seeing it spray through the haze and trees as the depth of the village stretches out in front of you is breathtaking. With the visual presentation so sufficiently modernized, it's easier to compare Ocarina of Time 3D to more recent entries in the Zelda series. No longer is it just "good for its age"—now it stands on equal footing with its peers, and its strengths become that much more evident. Ocarina of Time never really rambles. It's always on message, it's very to the point. You know what you're doing, you know why you're doing it. There are no protracted quests that seem without purpose, no wandering without an idea of what you're supposed to do. It's very tight and efficient, while still being hugely rich with content. More recent Zeldas tend to get a little rambly, and it kind of shows going back through Ocarina. There have been a few tweaks to the visuals and interface that actually affect how you'll play through certain parts of the game. The much maligned Water Temple is the most obvious example here, where clear paths to important areas are now lit up along the walls, and camera pans point out what was so easy to miss in the original. It almost feels like cheating, if you're familiar with how it used to be. Eiji Aonuma, one of the directors of the original Ocarina of Time and a producer on this remake, seems to have carried a burden regarding the Water Temple's difficulty for a decade, and he winces and moans every time it's brought up in an interview. I'd almost suggest that he overcompensated a bit and made it too easy now, but if that's what it takes to keep his ulcer from burning through his stomach lining completely, so be it. The most influential change to that dungeon, though, has nothing to do with its construction whatsoever. The touch-screen item interface facilitates immediate toggling of the Iron Boots, which used to require entering and exiting a menu system whenever you needed to take them on and off, which was... all the time. The bottom screen is pretty great in general, and streamlines a lot of common actions. 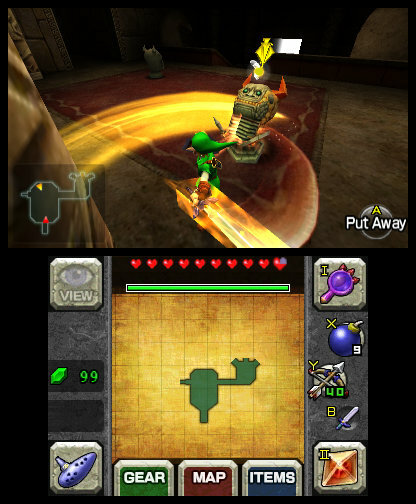 There's a dedicated ocarina button so you don't have to eat up an inventory slot when you want to play a song (again: helpful in the Water Temple), and an additional two touch-screen item slots mean you can keep that red potion at the ready during a tense boss fight without worrying about actually pressing the button and drinking it too soon. There are even nice touches like being able to press the X/Y button icons on the screen when you brain fart and don't feel like remembering which physical buttons correspond to what. Rounding out this Enhanced Package are the gyroscope camera controls. I was an immediate believer in the 3DS gyroscope when I played Face Raiders and Steel Diver. The responsiveness and precision are through the roof, and there's this sense of "oh god I am really doing this" you get from panning that screen around in front of your face. 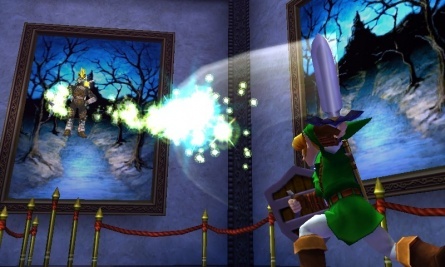 In Ocarina of Time 3D I found myself using it less for sweeping motions, and more for tiny adjustments. The analog slider is functional at the same time as the gyroscope, so I'd use that slider to get my target in my field of view, and the gyroscope for the finishing tweaks. For those tiny moves, though, it's shockingly spectacular. I beat some of the shooting gallery games in just one or two tries, and I remember them taking me forever to master back on the N64. The "extras" you get in this package, ranging from the hint stones that represent Nintendo's latest foray into Super Guide mechanisms to the boss battle gauntlets that showcase the parts of the game you could never re-experience without starting over from scratch, are just icing on the cake. The Big Extra is the Master Quest, a reshuffling of content previously only available on the Ocarina of Time bonus disc that you got by preordering The Wind Waker. They've even given it a bit of a revamp, doubling the damage you take from enemies and mirroring the entire world. The mirroring in the Wii edition of Twilight Princess was criminal, but this is the right way to do it: as a second quest meant to challenge and disorient. It's hard to place yourself back in the late 90's and think... was Ocarina of Time really that much ahead of its time, or has the series just not evolved appreciably in the last decade? 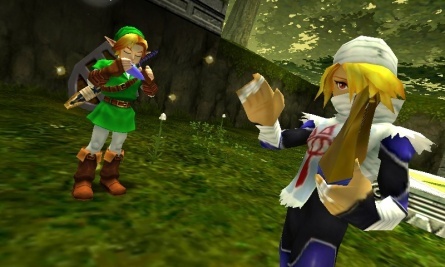 If Ocarina of Time 3D wasn't a remake and came out today, I doubt anyone would bat an eye. With the external trappings modernized, it still stands up there with the best of them. Now let's just get a Majora's Mask remake in the same vein, and no one will have to get hurt.